A beautiful combination of halo and pave diamond accents gives this designer engagement ring its flair and brilliant sparkle. This platinum band can be set with a round diamond from 0.7 to 1.5 carats. If you want an attention-grabbing ring, this is the setting for you. Double halo, pave setting, split-shank, this ring has it all! Designer engagement ring that masterfully combines several popular styles into one sophisticated, stylish setting for your center diamond. 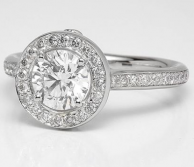 Halo diamonds will surround your main stone, followed by a split shank with pave diamonds on the platinum band. To top it off, there are 2 pink sapphires on the side under the center diamond. A very unique, breathtaking choice! Beautiful, unique designer engagement ring with graceful flower pattern surrounding your center diamond and 2 rows of pave diamonds stemming from the split shank near the top. Plus, 2 "surprise" pink sapphires sit under the basket of the center diamond. 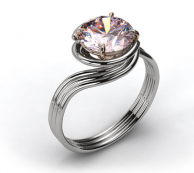 A very sophisticated and luxurious ring!